Suzanne Christine was born in Westchester County and has lived in the Hudson Valley all of her life. She grew up within view of the Palisades and has loved the river since she was a child. 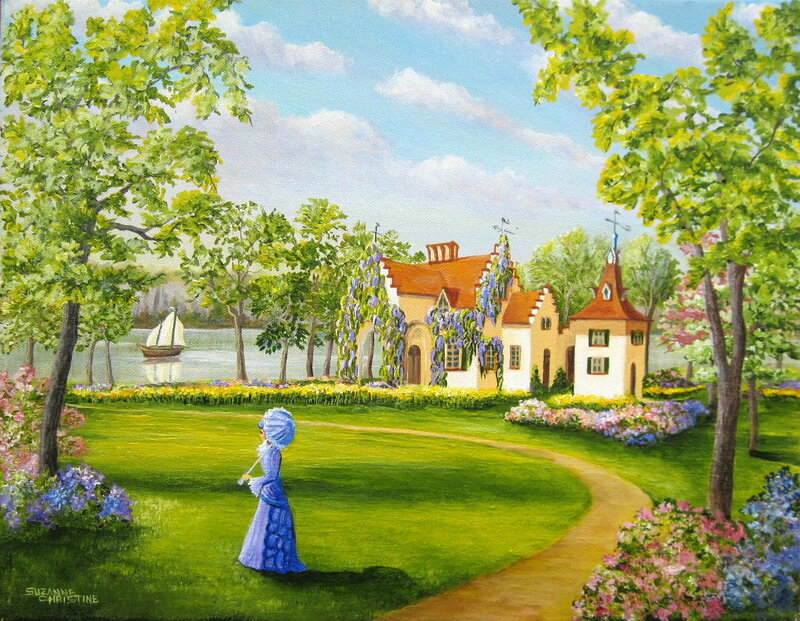 Having lived a short distance from Philipsburg Manor and Washington Irving’s Sunnyside, The artist is known for depictions of these and other historic sites. Working in her Westchester studio, Suzanne uses oils and acrylics on acid-free archival canvas. The artist began painting years ago to illustrate her poems and children’s stories. It was a natural progression to begin portraying local legends such as The Headless Horseman and Rip Van Winkle. She now paints daily to meet the demand for her work. “The Hudson Valley is an artist’s dream location; what joy to paint scenes for people who love these places as much as I do! The thrill never diminishes. It is a blessing to live in an area so rich in historical treasures and magnificent scenery. The natural splendor of this valley is a constant source of inspiration and pride”. Suzanne’s paintings are available through Historic Hudson Valley at Philipsburg Manor, Sleepy Hollow, NY; Washington Irving’s Sunnyside, Irvington, NY; Van Cortlandt Manor, Croton-on-Hudson, NY; as well as directly from the artist (schristine1@verizon.net).